Vegetables is one of the important foods that need to be taken by everybody and should be included in the diet system. Organic vegetables are becoming popular than the ordinary vegetables due to it healthiness. Organic vegetable is easy to plant and you can consider planting it at your own garden. Organic vegetable gardening is becoming more acceptable as people do realized that the use of pesticides and fertilizers is no good but cause more harm. Using those components are without doubt that the vegetables is bigger and will enable farmers to harvest those vegetables faster but the chemicals used will have negative impact on consumers’ health. Unlike the organic vegetables which are free from those chemicals. Before the use of chemicals, those early days farmers relied only on sunlight and irrigation for the vegetables gardening and thus we can consider that the concept of organic gardening is a comeback. That is why we can do it at home as it only need three basic things namely soil, water and sunlight. Are there any limitation to the type of organic vegetables that we can plant? The answer is any kind of vegetables is suitable and this include broccoli, cabbage, carrots, onions and lot more. The only thing that you need to know is which type of vegetable that suit to different seasons during planting. 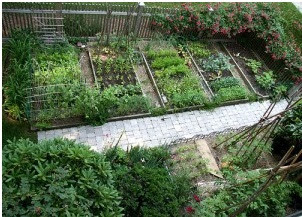 Organic gardening requires proper drainage and is very important . If not, you can check whether is it feasible to use a raise bed. You can buy those seeds from the store which are sold in packets. Read the instructions thoroughly before start seeding them. The challenging part during gardening is to make sure nothing happen to it until harvesting time. Those vegetables may be under the attack of weeds or pests or any other animals. You may need to get a bird or a toad to eat them. For weeds , it is easier as you can pull those weeds one by one from the ground. For prevention from other animals, putting up a fence is a good idea too. Another solution to prevent pests is to use mulch. Chipped barks , garden compost, leaf mould and manure can be used as mulch. These mulch must be placed some 8 to 10 cm from the ground to be effective. Organic vegetables gardening can also be done indoors. For example you can plant tomato by using organic container which is made from clay, plastic or wood. Make sure it get enough water daily and adequate sunlight for it to grow properly. Those containers can be placed outside during day time and if the weather is too cold, take them inside your home and put near the windows. Another point to remember that if you want to use such containers , then do not use soil but replace it with a mixture of peat, perlite and vermiculite. It is quite a challenge in organic vegetable gardening but worth your health safety. It also give some savings of your money and it can also generate small income as you can sell whatever excess in the market.